TechnicBRICKs: TBs TechPool 11 - Which is your favorite flagship? TBs TechPool 11 - Which is your favorite flagship? Not every year we get a real TECHNIC flagship, some would say. Also it seems that lately, the real flagship sets have been out once every two years. But of course this also may depend on the opinion of each one. 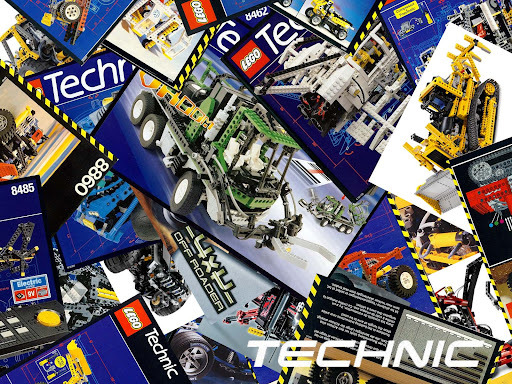 So lets list the biggest TECHNIC sets from each year, since the Expert Builder sets were introduced in 1977 and let you vote on your favorites. 8461, Williams F1 Team Racer (2002) - In fact re-branded as a RACERS set and very similar 'Silver Champion' (8458) from 2000. The largest branded TECHNIC set in 2002, was the 'Pneumatic Crane Truck' (8431), however a re-edition from 8460 in 1995 and re-released as 8438 in 2003. 8852, Robot (1987) - The only TECHNIC set in this year. 8090, Universal Set (1982) - Apart a Supplementary Pack, the only TECHNIC set in this year. As usual for these type of TBs polls, your vote is not limited to one entry. And lets see during the next 3 weeks, which one is the most favorite of all. Yes... I imagined this would happen. Even those who are not younger, may tend to better remember about the newer sets or fell them more appealing. Some old sets are still very nice looking, others not so nice looking anymore but still representing a great set forward at their time. But not all would be able to recognize it, in a short reflection, if haven't thought about that before. It would be very difficult to get fair an normalized results, from a poll like this with votes gathered this way. Definitely the Bulldozer is a great set! But apart from being very fresh in the memory of everyone, I doubt its 4 motors and not so much technical features would justify the #1 position. Maybe that's why, I haven't done such a poll before and was somehow reluctant. The voting is following almost the alternate year pattern. My favorites are the 8480, 8880 and 8868. They all introduced new parts and functionality never seen before and were more complex mechanically than 8275. I would have picked the bulldozer because of the excellent set of power functions parts you get but it is so mechanically simple it's boring. And besides, when you consider the fact that there is now (IMHO) a better selection of parts to choose from than ever for designers to make their models out of, the 8880, 8480 and 8868 are actually doing very well against there more modern rivals. Oh, made by yourself... congratulations! :) It's very good! Now it takes place on my desktop! I'm not sure what my favourite is. I don't have the bulldozer yet. looking at images, the 1994 super car is quite cool, I think LEGO should make an updated version of it. The 1999 super car, and the Silver Champion are also quite cool. Also seems that in the last few years, the best sets are every second year, so this years truck should be good.I liked the 2006 tow truck, but mostly for the pieces, like the 15 long beams. I can't wait for this years set, and also can't wait to get the bulldozer.